Long before Danitrio made the more modern Snake, the snake motif was also produced by manufacturers Waterman and Parker. Parker produced this very successful Snake in 1908. This 38 Snake eyedropper-filler is Gold-filled on black hard rubber. The eyes are emerald, making this pen even more unique. 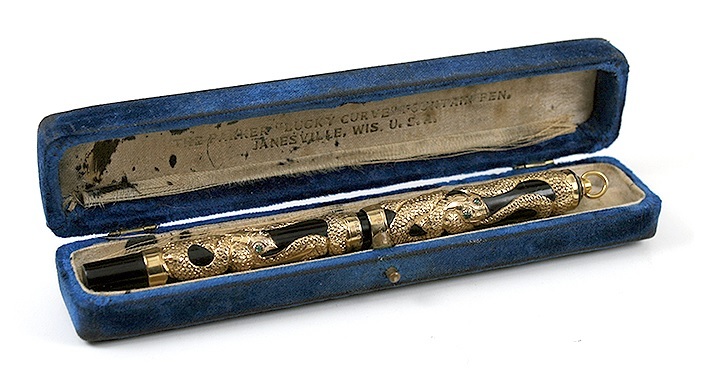 Parker ordered George Heath, a skilled designer of jewelry, to cover a pen with a snake motif, with the motivation of having something eye-catching to get his salesmen’s foot into the door of a retailer. The earliest examples have a round cap top and an imprint, just like on this one, which reads “Parker Fountain Pen Pat. 6-30-91 1-3-05 Design Patent Pending.” Even rarer to be found with a ring-top, this being only the second one known. This specimen had a fine nib and was in near mint condition and today, these pens are very rare, and very valuable. The original retail price of the gold-filled model was $10.00 while the sterling silver model was only $8.00. This specimen is now sold. Isn’t it a stunning piece?